The German music industry has broken off talks with Google's (GOOG) YouTube service after failing to agree on licensing fees for its members' work. The GEMA group that represents 65,000 German composers, songwriters and music publishers said Thursday it will now take its case to an arbitration body. The group, which represents copyright holders outside Germany as well, also demanded that YouTube change the notices that appear on thousands of videos that are blocked in Germany because of the licensing dispute. It said the notices blaming GEMA were misleading. 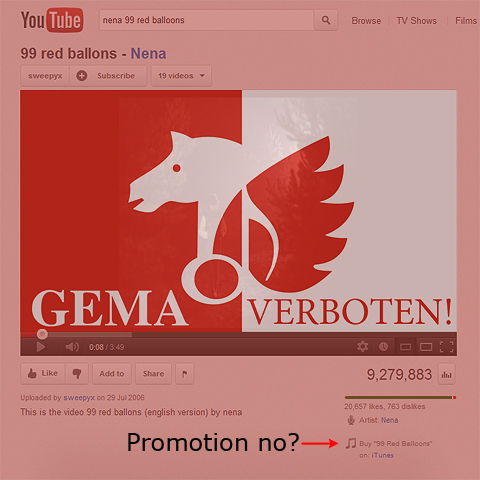 Spokeswoman Mounira Latrache said YouTube was "surprised and disappointed" that GEMA had broken off the negotiations.